Holiday celebrant Willis Bennet (neighbor and friend) hanging Christmas lights on a late November day. Yep, it’s official. The holiday season is underway. 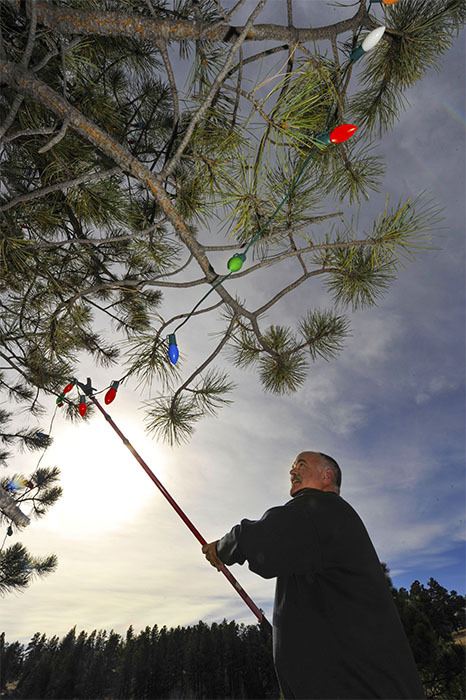 My neighbor and friend Willis Bennett was stringing outdoor Christmas lights on his trees yesterday. I looked out my office window and sure enough I saw WB with pole in hand reaching confidently toward the tops of his plump Ponderosas. We’ve had an on going neighborly battle for years on who would have his lights up first . This year I cheated and strung my deck rail lights the day after Thanksgiving. In Evergreen you can always count on a cluster of days that are more like warm October days and perfect for prepping for Christmas. Willis goes all out. It seemed he was a little late this year but I think he was overcome by a late Thanksgiving and a whole lot of turkey. His seasonal efforts take much more planning and time than my rather pedestrian deck strand of lights. Mind you, this is not a commercially designed set of lights he orchestrates. It’s just a regular guy who I have always known as the ultimate optimist- awesome father and husband- who defines fun and definitely is a prime recruit for a Santa Helper. This time of year this fellow oozes Christmas. Just to be fair, I am going to wait to strike my lights after “Griswold” ( my nickname for Willis during the holidays ) has illuminated the neighborhhod. All content © Eric Lars Bakke / Photographer unless otherwise noted.